The world’s second smartphone with in-display camera technology is here… and it’s both a beaut and a beast. Unfortunately, by “here”, we mean China, as the Huawei Nova 4 saw daylight earlier today in the same huge market where Samsung’s road-opening Galaxy A8s was unveiled last week, with no word on international availability just yet. Coincidentally (or not), the Nova 4 shares the same screen size with the Galaxy A8s in addition to an extremely similar “hole punch” camera identically approaching the old bezel-killing problem. The 6.4-inch display of the Huawei Nova 4 sports a respectable FHD+ pixel count (2310 x 1080), with a small but noticeable chin in tow that yields a total height measurement of 157 mm. As you can imagine, the dimensions of the Nova 4 and Galaxy A8s are incredibly similar, but impressively enough, Huawei’s new guy packs a significantly larger 3,750 mAh battery while weighing 172 grams. In contrast, Samsung’s hole-in-display pioneer tips the scales at 173 grams with a 3,400 mAh cell under its hood. Of course, the Huawei Nova 4 is not a flagship device through and through, pairing last year’s (still-powerful) Kirin 970 processor with up to a whopping 8GB RAM. That makes it plenty fast to take on the Snapdragon 710-based Galaxy A8s, but certainly not as impressive as the Kirin 980-powered Huawei Mate 20 and Mate 20 Pro. The tiny hole drilled into the beautiful screen of the Nova 4 houses an impressive-sounding 25MP selfie camera with f/2.0 aperture and a full slate of AI enhancements, while the rear-facing shooters are obviously even more remarkable, combining 48, 16, and 2MP lenses. 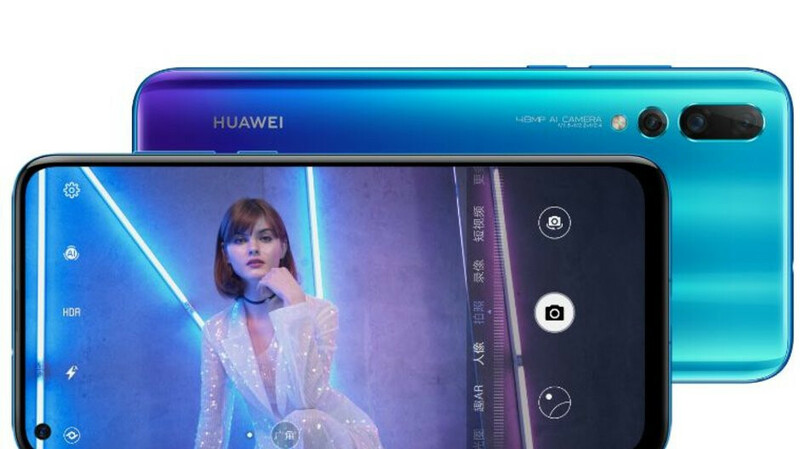 That’s right, the main rear cam is a 48-megapixel powerhouse with f/1.8 aperture, although if you can’t afford that particular model, Huawei also has one with a triple lens arrangement composed of 20, 16, and 2MP sensors. The top-tier configuration will reportedly go for the rough equivalent of $490 in China, with around $450 buying you the slightly humbler variant. Both Huawei Nova 4 versions run Android 9.0 Pie on the software side of things, also sporting “classic” rear-mounted fingerprint scanners. Coated in red, blue, white, and black, the Nova 4 stands out with a shiny 3D glass body as well that seems to reflect light in some very original ways that make the phone change its color depending on the angle you’re looking at it. It almost goes without saying an official US release is out of the question, but Europe availability info should follow soon enough. It will also be interesting to see what this design means for Huawei’s next-gen P30 flagship family. Some sort of resemblance seems pretty much guaranteed. With a better front facing camera. I'll take Samsung offering over this crap anyday. I dont know man, sd710 is powerful chip and i think gpu performance is much better on 710. Not really. CPU is similar. GPU is better on Kirin. Is the kirin 970 P20 pro chip not on par with the snapdragon 845, thats flagship specs in the nova is it not. Then why is it that other Chinese manufacturers prefer using the SD845? OnePlus, Xiaomi, Vivo and Oppo ALL use the SD845. Because Huawei didn't sell Kirin 980 to other manufacturers? Duh..
PA`s bug isn't allowing me to complete my above comment. Neither am I able to complete the info in this comment. Fix it PA! Awesome. I’m a fan of Huawei’s Nova series, and the Nova 4 did not disappoint. The Nova 3 has been available for purchase on Amazon with the proper U.S. LTE bands, and I’m hoping that the Nova 4 follows suit. This is a great bang for your buck smartphone!